For other uses, see DCC (disambiguation). Click [show] on right for more details. Please replace HTML markup with wiki markup where appropriate. Add wikilinks. Where appropriate, make links to other articles by putting "[[" and "]]" on either side of relevant words (see WP:LINK for more information) and check that your links work as expected. Please do not link terms that most readers are familiar with, such as common occupations, well-known geographical terms, and everyday items. Format the lead. Create or improve the lead paragraph. Arrange section headers as described at Wikipedia:Guide to layout. Add an infobox if it is appropriate for the article. 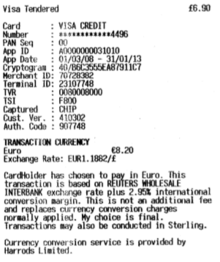 Part of a credit cart receipt from 21.8.2010, indicating that DCC takes place. Dynamic Currency Conversion (DCC) or Cardholder Preferred Currency (CPC) is a financial service in which holders of credit cards have the cost of a transaction converted to their local currency when making a payment in a foreign currency. Currently this feature is only possible for Visa and MasterCard networks. American Express provides for multi currency transactions for ecommerce merchants. DCC provides consumers with a rate of exchange at point of sale rather than waiting for a statement at the end of the billing cycle. The calculation of currency exchange is not computed by the issuer of the credit card but by the merchant who can set the rate of exchange. There has been controversy because some merchants have run dynamic currency conversion without giving the option to the cardholder or charge rates far in excess of what a bank might charge. In a typical transaction situation, cardholders are handed their receipt with an option to sign for the amount in the foreign currency or their home currency. Depending on the service provider, an explanation of the exchange rates are included (as shown on the scan displayed in this article) along with the prevailing rate of the day. The rates used, however, may or may not be based on the wholesale rate; this is dependent on the DCC provider. Some providers use Reuters Interbank for the exhange rate of transactions, and offer chargeback programs if a better rate can be shown to exist during the day of the purchase. If the wholesale rate is used, the customer benefits from transparency and certainty. "I DECLARE THAT I HAVE BEEN GIVEN CHOICE OF PAYMENT CURRENCY. I AGREE TO PAY THE ABOVE TOTAL AMOUNT AND ACCEPT THAT THE CHOICE OF CURRENCY IS FINAL. I UNDERSTAND THAT THIS FACILITY IS PROVIDED BY THE BANK AND NOT THE CARD ASSOCIATION"
The biggest advantage for a merchant is receiving a small percentage of the currency conversion margin that is charged to each transaction. These financial returns make the process of DCC more appealing to merchants with high foreign volume. The merchant earns extra revenue when the transaction is processed through DCC, and explanation to the customer about the nature of DCC is left to the individual merchants. Many consumers  are concerned that using DCC will result in higher credit card conversion fees than if they used their own card issuer's exchange rate. In many cases, the price of the purchase can be much greater (5 to 7%) without any advantage to the customer other than seeing the amount paid in their currency directly on the credit card slip. ^ Collinson, Patrick (12 July 2008). "Going to Spain? Just say no". The Guardian (London). http://www.guardian.co.uk/money/2008/jul/12/foreigncurrency.consumeraffairs. Retrieved 1 May 2010. ^ Gayle Keck and R. Paul Herman (31 Jul 2005). "Charge It . . . but Check the Math". The Washington Post (Washington, D.C.). http://www.washingtonpost.com/wp-dyn/content/article/2005/07/29/AR2005072900927.html. Retrieved 2 Jul 2011. ^ Brignall, Miles (15 Feb 2010). "Ryanair's Hidden Costs From Currency Conversion". The Guardian (London). http://www.guardian.co.uk/money/2010/feb/15/ryanair-costs-currency-conversion. Retrieved 8 Feb 2011. ^ Corrigan, Damian (N/A). "Ryanair's Multiple Credit Card Fees". About.com (Spain). http://gospain.about.com/od/ryanair/f/credit_card_fees.htm. Retrieved 9 March 2011. This page was last modified on 2 July 2011 at 08:52.